I'll have to think of an award for Dr. Khong who visited our Center two days in a row this week! She stopped in for surgical and clinical observation on Monday. We don't usually do procedures on Mondays, so it's cool how we happened to fit that in with her schedule. I'm really jealous that she was able to observe a CK procedure! I have never actually seen Dr. Holzman do a CK procedure before, so I've got that on my radar to observe and video tape one soon. I'll post it here! 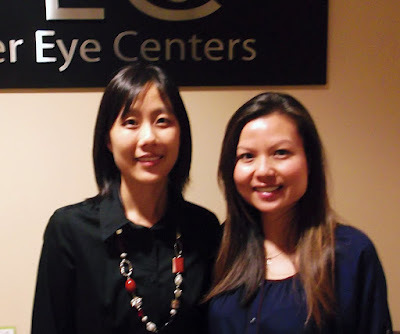 On Tuesday, she came in for my first New Affiliate "Hands On" LASIK 101 Night. I have to admit that being in a room full of new, unfamiliar faces was little bit daunting to me (I'm such a wallflower! ), so it was nice to see Dr. Khong in the office as a "familiar" face from the day before! I'm really jealous that she got to fire the laser! Never done that before either!